Eleanor Dickson Koehl officially joined HathiTrust with an appointment at the University of Michigan Library as Digital Scholarship Librarian on December 17, 2018. Eleanor’s new assignment has her continuing to work as a part of the HathiTrust Research Center team, where she assumes the role of Associate Director for Outreach and Education. Previously, as Digital Humanities Specialist within the HathiTrust Research Center team at the University of Illinois, Eleanor co-developed and -delivered, with Harriett Green, an instructional program on the topic of text mining content from the HathiTrust corpus, including an IMLS-funded curriculum to promote text mining skills in the library profession. Eleanor also served as chair of the HTRC Task Force on Non-consumptive Research Policy, which developed the 2017 policy enabling the non-consumptive research use of the entire HathiTrust corpus, including items held in copyright. 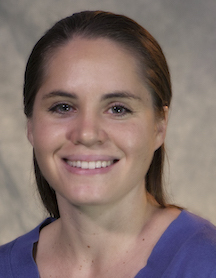 Working as a part of HathiTrust staff and the Research Center teams, Eleanor will help better serve HathiTrust members and facilitate new scholarship and teaching through activities aimed to expand use of text and data mining services. She will focus on expanding the curriculum developed during the IMLS grant, and deepen engagement with member librarians and scholars on text mining resources for the HathiTrust corpus. Please join us in welcoming Eleanor to her formal role within HathiTrust!